World Snooker Championship Day 2: 21-year-old Crucible Debutant Cao Yupeng upset Mark Allen to reach the second round. 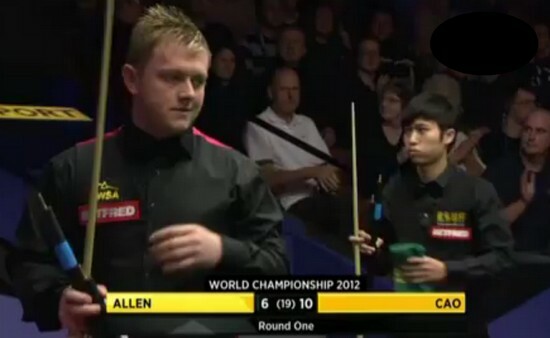 The World Number 81 led Allen by 5-4 overnight before the final session kicked off today. The youngster took the opening two frames of the session, including a break of 108 his first century at the Crucible to go 7-4 ahead. Allen pulled one back before Cao made his second century 113 and scoring another frame to get the match point 9-5. The Northern Irish showed his fighting spirit in frame 15 with 101. Looking very likely to stay in the match having clearing from blue to black, after Allen potted the black he was about to leave the arena, thinking he was ready to start a real battle. However, the cueball went off in seconds and he lost the frame and the match. He handed the victory to the Chinese. I am very disappointed with Allen's behaviour towards the Chinese players. I understand that defeat is terrible to him but there is no reason to brand the other Chinese players for using certain 'tactics' to earn wins. This disrespect is discrediting the sport and sportsmanship. The 'push' shot that Allen claimed to be foul, Allen should approach the referee right away. He should not put the blame on others. David Gilbert scored a 10-8 victory over Martin Gould despite Gould pulling three frames from 5-9 down to 8-9 with back-to-back centuries. Gilbert kept calm in frame 18 to make 54 for winning the match. He reached the last 16 at the Crucible for the first time and he is playing Neil Robertson next, who beaten Ken Doherty by 10-4. Gilbert said, ""It's a massive relief, at 9-5 I just wanted the match over as quickly as possible and Martin just started to play brilliantly. I felt fine yesterday, I had no great expectations I knew that if I played alright I could compete. I started well and just carried it on. It was a bit of a struggle today but it has to be expected, I'm not used to playing here but now I've got over the line I feel great." Stephen Hendry, who knocked a maximum yesterday beaten Stuart Bingham by the same scoreline 10-4 to meet John Higgins in the next round. Stephen Maguire holds 6-3 advantage on 17-year-old Belgian Luca Brecel after wrapping today's session. 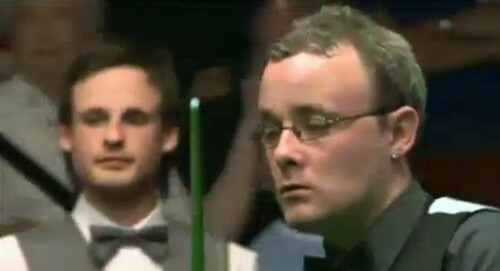 2005 World Championship leads Jamie Jones by 5-4, their play resume tomorrow as well.